We can't wait for you to meet Justin at the tenth annual TeenBookCon on March 30—he'll be there alongside 23 other wonderful young adult authors and thousands of fans. Tempting though it sounds to time travel straight to the festival, that technology continues to elude us here at the shop. So instead, tide yourself over by checking out our exclusive Q&A with the author below. Then take a minute to register for TeenBookCon so you can meet Justin, ask questions, and get your book signed. We'll see you then! This is your debut novel, following experience as a NASA intern, a registered nurse, and plenty of other stops along the way. Can you tell us about your journey to becoming an author? My journey to becoming an author—well, where do I even start? It’s been a long, windy road, that’s for sure. Along the way I’ve picked up a couple of random degrees and worked lots of odd jobs, all the while knowing in my heart of hearts I wanted to be a published writer. I finished my first manuscript when I was in my mid-20s (back when you had to submit ms via snail mail and wait for a year to hear back haha); I got great feedback, and some interest, but in the end I was told my story didn’t suit the market. The same thing happened several years after that; you have so much potential, but. It was frustrating, but at least this time I didn’t lose a small fortune in postage; thanks, email! A couple of years later, I decided to try one last time, this time putting all of my heart into this one story, and that if it didn’t work, it wasn’t meant to be. That story was Opposite of Always. Time travel plays an important role in this novel. What attracted you to that theme? And how did you keep track of everything? I was attracted to time travel because the idea of re-dos fascinates me. We all think about what we might do differently if given a chance. And then two people I love very much passed away, and in my longing to see them again, even for just a moment, I asked myself what would I sacrifice for that opportunity? That question was the germ for this story. Initially, it was definitely challenging to keep track of each timeline. And I tried various ways to tell this story, including non-chronologically, which was sorta cool but I worried it was too confusing and complicated. So, I decided to center the story around a few different events, each of those events unfolding in new ways in each timeline. Do you have some favorite time travel stories that inspired you to write Opposite of Always? Any recommendations for fans of the book? Honestly, I have more time travel movies that I love than books. But one book that I really enjoy is a graphic novel called Seconds by Bryan O’Malley (author of the Scott Pilgrim series). Through humor and pain, it examines the consequences of attempting to craft the perfect life through time travel. 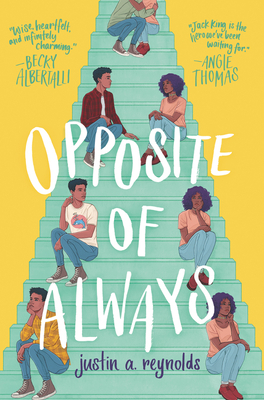 One of the beautiful aspects of this novel is the relationship Jack has with his parents—it rings full of love, support, and humor. How did you develop those family relationships? The relationship that Jack has with his parents was very important to me. From the outset, I knew I wanted to feature a set of parents that were super supportive and incredibly loving and fully-formed. I also wanted them to be funny and unapologetically in love with each other. More importantly, I wanted them to foster reliable, healthy relationships with Jack’s friends; to care about them as if they were their own children. In this story, they are often the stabilizing force, and their love is constant and tangible, even when the rest of the universe is spinning out of control. Are you ever inspired by the books your daughters read? What do you like to read together? My daughters inspire me in all that they do. They are the reason I decided to try this author-thing one last time; I wanted them to be proud of me, and I wanted them to believe me when I told them that every dream is well within their reach. My oldest loves the Diary of a Wimpy Kid series (like every kid, right? ); she’s really into graphic novels and stories built around sports. She often asks me why don’t I write something cool like that. My youngest tastes are fairly wide-ranging. But she’s really into art and dance, so a lot of what she reads features those elements. Oh, and she loves comedy! So, as you might imagine, we regularly leave bookstores and libraries with our arms full—no complaints from me! So, I never like to talk about my works in progress, but I will say this: it’s a story that grapples with how we love in the face of great loss. Surprise, surprise, hahaha!